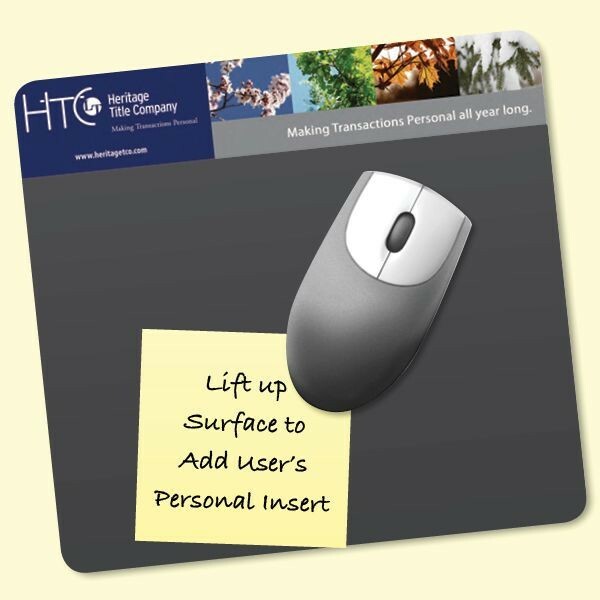 #FLH7 7 1/2" x 8" x 1/8"
These popular Frame-It Lift® DuraTec® 7.5"x8"x1/8" Lift-Top Window/Photo MousePads let your prospects add personal content like photos, phone lists, notes, software shortcuts, training guides, and quick reference info into this pad's large window area by lifting up the mousepad's surface. Mixing your customer's cherished photos & critical notes with your branding makes this promotional mouse pad more valuable to your users and more effective for you. Made in the USA using materials ALSO Made in the USA. This ensures your promotion is kept close at hand and in sight. For extra impact, add a custom window shape, business card window, or custom insert to this versatile mousepad. This mouse pad's DuraTec® base is odorless & latex-free making it perfect for hospitals & schools. Minimum order is 100 pads.